I could harp on about the weather, but I'm not going to, I mean, you've all seen the forecast and will be wondering how we'll be walking on the only 2 days this week when it's not sunny! The forecast could change though, you never know! My injury is another thing I'm not going to write about either, as I'm told that this "groin problem" is the best set up for an excuse of not finishing they'd ever heard (thank you to my wife, Emma for that comment)... She was joking though... I hope! One thing I will write about is yesterday afternoon, as I looked out of my office window at the NSC and saw the queue growing for registration (it was only 4:30), everyone seemed eager to make sure that they were ready to collect the timing dibbers and be prepared for the start of the race. After registration had opened, I wandered over the tent that had been set up especially for the occasion. 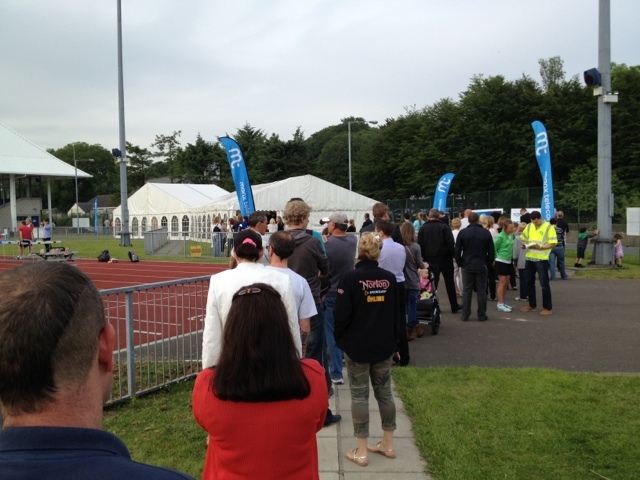 As I walked to towards the queue, I met Minister David Cretney who wished me luck, I offered him my best wishes and he walked off smiling, it was then that I realised that everyone else coming from the registration tent was also smiling and laughing, obviously the buzz of the event had begun and was seemingly infectious. I joined the queue and there were loads of people in front of me, the atmosphere was great, people chatted about how far they wanted to go and how much (or little) training they had done. As I got to the registration tent, the steward asked for my number, when I said it was 79, he said to me "Ah, so you're the elite then? ", I was secretly chuffed to bits, but replied "not quite"! I got the dibber activated and collected my goodie bag (thank you to the organisers for this). Today I've done a few things differently to most other days, like not drinking tea or coffee, as you will probably know these make you want to go to the loo more often, so I drank loads of bottled water... which ironically made me go to the loo more often! Another 'break from the norm' today was that I've been very conscious of how I walking as I'm paranoid that I'm going to get injured and have done my best to avoid any bumps in the pavement and to ensure that I don't walk too fast and pull a muscle. If you're a walker in the Parish, then you're probably thinking "there's nothing strange about what he's just wrote" but if you're a casual reader of this blog, it'll sound absolutely mental... But that's what Parish Walker's are! I mean, who in their right mind would think that walking 85 miles in one go with a 24 hour finishing limit was a good idea? I suppose that the reason why there's such a good atmosphere on the day is because we're all like minded fools and understand that whatever your goal during the day, at some point you all looked at the application form and thought "I must be mad, but I'm doing it anyway"! I'd like to thank my fellow walkers and readers (all 7 of you) for taking the time to look am my rambling a over the last six months. When I agreed to write this blog in November last year, I was so excited that I would be able to share my experience with everyone and I hope that it's been interesting to you, but to be honest, I think it may have been harder work writing than actually training (although maybe that means I've not trained enough?!). Your comments and advice have been really helpful and I hope that as your walking by number 79, you say hello! Good luck to everyone taking part in the 2013 Manx Telecom Parish Walk and thank you to all the supporters, sponsors and organisers! Good luck tomorrow - i am sure we will all enjoy the day. 'So you're the elite'. 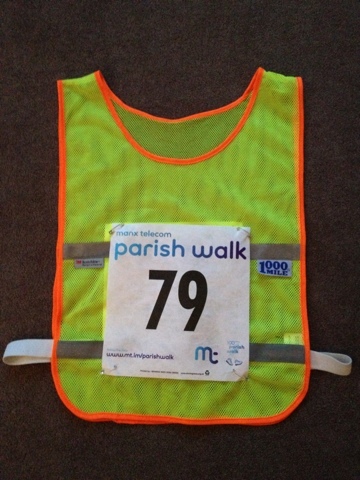 I am that steward ha ha ha.Doing the Parish for the first time 2014 and aiming to finish. One hit wonder kind of thing. Might try and hang on to your coat tails, until at least Braddan church ha ha. Best of luck, Kev.